Nature’s pattern for shiitake mushrooms is heavy growth in the spring and fall rainy seasons when daytime temperatures are in the 76-86°F/24-30°C range and nighttime temperatures are in the 50°F/10°C range. 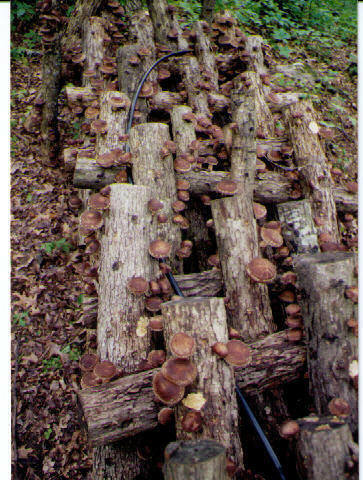 Spring rains stimulate or “shock” the shiitake mycelia growing inside hardwood logs and trigger the fruiting cycle, "the first flush," a pattern log-kit owners can imitate by soaking their logs in ice water. In Asia, where shiitakes grow naturally, this time of year is a major gathering season. For US shiitake mushroom farmers and shiitake log owners, it's a blooming boom-season as well, according to Sandra Williams of Lost Creek Mushroom Farm. "Spring temperatures, spring rains, and increasing sunlight hours wake up the shiitake growing inside inoculated (seeded) logs. The shiitake "fruits," or blooms, reproduces by releasing spores, and then replenishes itself until the fall, when conditions are again optimal for fruiting." In the forest, the microscopic spores travel -- perhaps for miles -- alight on branches, and settle into the bark. Shiitake is a decomposing fungus; and when a branch dies, the spores can then work their way into the sapwood, where they form threads of mycelia. The mycelia digest the sapwood. In time the branch drops to the ground. As they extend their threads, the mycelia form a colony inside the log. About a year later, with the spring rains, wild shiitakes push up through the bark, easily accessible for gathering. The log kits grow in the house like plants or outside in shade. They can be “forced” or “shocked” with ice water to produce mushrooms every two months. They will grow organic, fresh shiitakes for 3-4 years or more. Logs require regular soaking in non-chlorinated water. Log kits range in price from $18 for a 5-6 inch ‘Shroomie to $80 for a set of two 14-inch logs with soaking trays shipped to the same address. “With two logs, owners can alternate the producing log and get a crop every month,” Sandra explained, or a double harvest every two months." All kits include a log, ready to bloom, instructions and recipes. 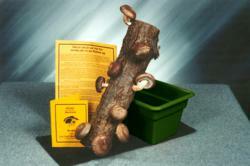 Kits 9 inches and larger are fully guaranteed to grow shiitakes. Sandra and her husband Doug started The Voice of the Mushroom Foundation to promote education, mushroom production and consumption for health and well-being worldwide. Their Mushrooms in Ghana Project, started in 2008, has been training farmers in shiitake log production and is providing a spawn laboratory at Bemcom Training and Resource Center in Ghana, West Africa. Bemcom will make shiitake and oyster mushroom spawn for small-scale mushroom farmers, most of them women. Lost Creek Mushroom farm donates a portion of sales to these non-profit programs. More information and ordering for Lost Creek Mushroom Farm shiitake log kits are available at http://www.shiitakemushroomlog.com and by phone at 800-792-0053. Kits are also available on Amazon.com at slightly higher prices.